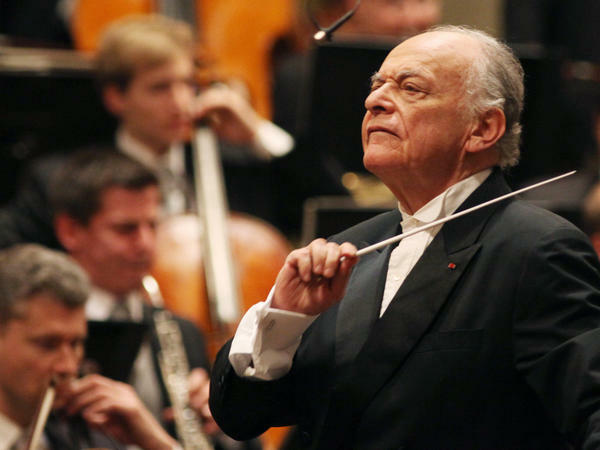 One of the most prominent American conductors, Lorin Maazel, died today at his home at Castleton Farms, Va. He was 84. His death was announced by the Castleton Festival, the annual summer series he founded. The festival officially attributed his death to complications stemming from pneumonia; however, the Washington Post reports that Nancy Gustafson, the festival's executive director, said Maazel had been suffering an "unexplained illness following a kind of collapse from fatigue" due to heavy travel and work engagements across Europe, Asia and North America, despite having cancelled several appearances, including performances at Castleton and with the Munich Philharmonic and Boston Symphony Orchestra this spring. Nevertheless, over the course of his lengthy career, he conducted more than 7,000 performances in concert halls and opera houses, and made more than 300 recordings. He served as artistic director of the Deutsche Oper Berlin (1965-1971), general manager and artistic director of the Vienna State Opera (1982-1984), music director of the Bavarian Radio Symphony Orchestra (1993-2002), Pittsburgh Symphony (1988-1996), Cleveland Orchestra (1972-1982), Munich Philharmonic (2012 until his death) and the New York Philharmonic (2002-2009). He founded the Castleton Festival in Virginia with his third wife, Dietlinde Turban Maazel, in 2009 as a full-scale, 500-acre music festival and summer school for rising young musicians.